From the towering marble cliffs and enchanting lagoons to its white sandy beaches, lush jungle and mangrove forest, prehistoric caves and waterfalls, El Nido is one of the top tourist destinations in Palawan, which is often referred to as the "Philippines' Last Frontier". El Nido is a coastal town in Palawan which is comprised of 45 islands and islets; limestone cliffs are also found here, which form a Karst backdrop. El Nido is more than just a stereotypical tropical paradise. Beaches, clear waters, jungle, steep limestone cliffs and stunning inlets make for one of the world's most beautiful seascapes. El Nido is also known for water sports such as diving, snorkeling and kayaking. In the November–December 2007 issue of the National Geographic Traveler's magazine, Palawan was chosen as one of the best travel destinations in the world, and particularly, it recommended El Nido and the Calamianes Islands. In 2012, CNNGo, the travel news website of the international news agency Cable News Network, declared El Nido as the Philippines' Best Beach and Island destination. El Nido Airport also known as Lio Airport is the primary and sole airport serving the town of El Nido. The airport can accommodate only small aircraft, so the prices tend to be much higher than to Puerto Princesa. Air Swift. Phone +632-3185941 or +632-3185943. Has flights to and from Manila and Cebu. Best to book via their website. Puerto Princesa International Airport (PPS) is Palawan's premier gateway. Philippine Airlines, Cebu Pacific, and Air Asia connect to Manila, Iloilo and Cebu. You can catch a bus, private or public van from Puerto Princesa to El Nido on arrival. The main roads of El Nido are organized around a set of radial and circumferential roads that radiate and circle in and around the town proper and its rural barangays. Its interconnected roads are connected to the major highway that leads Puerto Princesa, Palawan's capital. Daily Buses and jeepneys depart at San Jose Terminal in Puerto Princesa for El Nido. Tricycles are used for short-distance trips around the town proper. Air-conditioned RORO buses departs San Jose Bus terminal, Puerto Princesa and El Nido Market every 2 hour from 4AM to 10PM. Fare ₱380. Non-aircon buses operate regular trips between Puerto Princesa and El Nido, stopping in Roxas and Taytay. Departures are daily at 5AM, 6AM, 7AM, 8AM both from El Nido and Puerto Princesa. Travel time is 6-7 hours, fare ₱350. Departure in Puerto Princesa from San Jose Bus terminal and from El Nido Bus terminal. These buses are usually packed and they break down sometimes (which can mean delays of 20 minutes to 3 hours). The road is not paved all the way and can become very bumpy so riding near the front of the bus is recommended. You may book a seat the day before and try to get a seat next to the driver or in the front part of the bus. Oftentimes taxi drivers will try to get you on a more expensive chartered van because they receive commissions. When taking a taxi to the bus station be adamant about being dropped off at the bus terminal and not next to chartered vans. Three (3) van companies are doing regular shuttle trips to El Nido, departing from San Jose bus terminal in Puerto Princesa. Fares are ₱600 per person and ₱700 for hotel or airport pick ups (minimum 2 people) and the travel time is 5 hours. As part of lean season, Fortwally offers ₱600, one-way fare including pick up in airport or hotel. They also offer van sharing from Puerto Princesa to Sabang for ₱300/person. PPS-El Nido-PPS have daily trips from Puerto Princesa to El Nido. Tickets are available at Artcafe Travel Center and other outlets. Sabang - El Nido fare is P900 but they will only run if they have enough passengers. From Puerto Princesa to El Nido there are many daily trips. El Nido to Puerto Princesa fare is ₱900. Tickets are available from most guest houses and tour booking offices. The main port in El Nido, which is under the jurisdiction of the Philippine Ports Authority (PPA), is located in Buena Suerte (Zone II), although a number of small and accessible wharf, such as the San Fernando pier, are being used in other rural barangays. A number of ferry and other sea vessels owned by Atienza Shipping Lines and San Nicholas Shipping Lines have regular trips from Manila to El Nido. The two mainstream choices are either the Montenegro fast ferry (3½ hours), or large outrigger boats (8 hours). Montenegro fast ferry is a steel hull boat and leaves El Nido daily at 6AM for arrival in Coron at 9:30AM. For the return journey, departure in Coron is noon and arrival in El Nido is 3:30PM. Tickets cost ₱1760 one way, reductions for students, senior citizens and children apply. The large outrigger boats depart most days of the week from Coron Town to El Nido and v/v. The costs vary from ₱1200 to ₱1400 and departures vary between 7:30-9:00 am, depending on the schedule. The journey is 8 hours and includes a hearty hot meal. These are larger comfortable bancas, built for ferrying passengers. The scenery during the trip is beautiful. 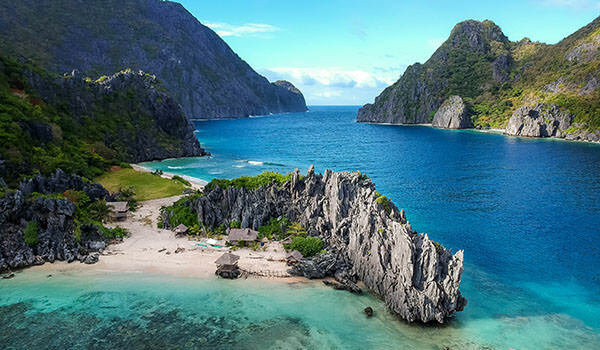 Matinloc Island, the longest slim island in El Nido, has a Secret Beach, which is a pocket of white sand beach at the corner of a sinkhole, that is inaccessible by boat and surrounded by steep rock walls. To reach it, divers must swim underwater through a narrow crevice in a rock wall. At noon, the sun streams in through the opening, allowing a play of light and shadow against its limestone walls. The beach floor drops abruptly. According to local legend, this beach inspired Alex Garland's novel The Beach, which was written while the author was in El Nido. Aside from the Secret Beach, the island is also famous for the Kulasa Beach, a 100-meter beach strip of fine white sand located at one of its coves. The sea floor surrounding the beach slopes gradually and the water deepens only after about 10 meters. There are four dive sites around the island with the one at the south tip of Matinloc being the deepest at 39 meters. A 4-kilometre (2.5 mi) stretch of powdery white sand and pristine azure waters which is 45 minutes to an hour away from downtown El Nido via tricycle. This rocky peninsula offers signature views of the twin beaches after a short vertical hike up the trail. Bacuit Bay is dotted with islands and islets, most of which are inhabited. Its clear blue waters are teeming with marine life. It is home to dugongs, turtles, manta rays, species of fishes, coral reefs, and the occasional whale sharks. There are over 30 dive sites ranging in depth from six to more than thirty meters. Pangulasian has 750-metre (2,460 ft) wide stretch of powdery white beaches in El Nido, which is very ideal for sun bathing, sunset viewing, and other beach activities. The waters fronting the beach are clusters of coral reefs that make this area a good snorkeling and diving site. A trail located in the middle of the island is a good place for bird watching, especially during early mornings and late afternoons. The trail ends at the peak of the island and provides and an excellent 360-degree view of the Bacuit Bay and nearby islands. Cadlao is the largest island in El Nido, occupying a land area of 10.06 square kilometers. Among all islands, it is the closest to town proper and has the highest peak that towers up to 640 meters above sea level. It is known for its white sand beaches, gradually sloping sea floor, hidden lagoons, and nature trails through its lush forest cover. One of these nature trails leads to the charming saltwater Makaamo Lagoon. Surrounded by mangroves, the lagoon is best enjoyed in silence at sunrise or sunset when the birds feed. There are a number of beaches on Cadlao, including that at Bocal Point, Natnat, and Paradise Beach on the southern side of the island. Sabang Beach in the north-east offers good snorkeling opportunities, though some visitors may recognize it as one of the settings for the Scandinavian TV show Robinson Expedisjonen, the predecessor to Survivor. Dilumacad Island has a beautiful white sand beach stretching to some 300 meters that is ideal for picnic lunches during island-hopping trips. There is an underwater tunnel at its northern side and a fringing reef on its southern end. The island is also called Helicopter Island because its limestone cliffs resemble the shape of a helicopter when it is viewed from a considerable distance. The island itself is small by land mass, but is rich in vegetation and has a thick, dense rainforest, along with some bare rock, that seems to rise directly out of the deep blue sea. An isolated beach that is located on the mainland, but only accessible by water, due to the mountainous terrain. Unlike most remote destinations in Bacuit Bay, there is a multi-story, high end resort here in addition to cottages and tent camping sites right on the beach. There are quite a number of small permanent structures throughout Seven Commandos. It is also a popular stop on island hopping tours. Cudugnon Point is an important anthropological site, where jewelry and pottery dating back to the Song dynasty (960-1279 CE) were yielded. The anthropologists believe that the cave dwellers were from Borneo, and travelled across the ancient land bridge that connected Palawan from Borneo. The crevices of its cave roof are inhabited by barn swallows and insectivorous bats. A small island surrounded by clear waters of El Nido, rock formations and a scene of towering mountains. A good place as a lunch area for Island Tour A.
Pinasil Island has a cathedral-like cavern accessible by dinghy and kayak. Its cool interior is lit at certain times of the day by sunlight coming through an opening at its peak. This one of important sites for the busyadors or the birds' nest gatherers. A surfing spot of El Nido. One of the mainland tour that become famous than Nacpan Beach one day. Very safe for a surfer pure sands, good waves every September to march and no almost waves during the season of summer. Almost the same in Nacpan but Duli is not busy or crowded. Located near Pangulasian Island, Vigan is also referred to as "Snake Island," because of the fine natural sandspit (s-shaped sandbar) that "snakes" off it shores. The sandspit is clearly visible only when the tide is low. On both sides of the sandspit are shallow swimming areas. Just one kilometer south of Corong-Corong, Marimegmeg beach is home to one of El Nido's very first resorts. Named Las Cabanas resort, tourists began incorrectly referring to Marimegmeg as Las Cabanas beach, and the name stuck. There is a zip-line between the coast and a nearby island that you can access via a footpath behind the beach. Aside from its several islands and beaches, tourists can also enjoy a mangrove tour along the Aberawan River where they can watch egrets roost among the mangrove trees at the mouth of the river. 12,000 years ago, El Nido was inhabited already by humans. Archaeologists found human and animal bones, potteries and even traces of 8,000-year-old cremation at Ille Cave. Ille is located at New Ibajay, a 45-minute drive from the town center, and is frequented by tourists. A 90-year-old house turned into a bar along Calle Real where paintings and handicrafts of local artists are put on display. Every night, live music is performed there then. Originally owned by Sabas C. Robles, the grandfather of Judge Sabas Robles Acosta, father of Andrei Ustares Acosta - the Palawanologist. Nestled around the towering marble and limestone cliffs and green hills, the town proper is a thriving tourist center where most cottages, bars, and souvenir shops can be found. Breathtaking views of nature are the main reason to visit El Nido. The pristine waters of El Nido offer beautiful coral reefs, while its beaches are uncrowded, exploring the lagoons by kayaking is a great way of visiting the islets, coves and caves are also abundant. Inland El Nido, springs and waterfalls are also found. Bacuit Bay composes of limestone islands, where its possible to either dive, snorkel or hike. The easiest way to see the Bacuit Bay is on an island hopping boat. These boats carry 6-12 people and will visit 4 or 5 destinations in a day. These destinations include: secret beaches, blue or green lagoons, various islands, and amazing natural land-formations. The boats usually take set routes named A to D, but can vary depending on tides and weather. Each boat trip takes you to 4 - 5 different places and favorite tours are A and C, though all of them are fantastic. Boats normally cost around ₱850-1200 per person depending in the route and travel agency. The trip takes one day (cca 9AM-3:30PM), normally includes a good lunch and can be arranged from most guesthouses and travel agencies in El Nido. El Nido municipality also charges ₱200 as an environmental fee which is valid 10 days. It's a good idea to book a boat with only 6 seats and experienced crew (e.g. at Relucio's). If you have time, go for overnight island hopping (3 days 2 nights is a good option) where you get to camp on deserted island ala Survivor style. (Though most places you can be dropped at are included in the daily island hopping tours.) It gives you the best option to visit lots more islands that are included in those bundle package tours but at your own leisure time. Find a few more people to get a much better rate. Recommended place a booth at Aplaya Restaurant, look for Nhel who will give you the best deals and arrangements. Bacuit Bay consists of islands with limestone cliffs which are ideal for climbing, diving and snorkeling; The most popular activity is island hopping costing from ₱1200 a day including BBQ lunch and snorkel gear. There are 4 basic day trips to choose from named Tour A to D and can be booked from all over town. The quality of the boat, guides & tour depends on who you book it through. The western side of El Nido township lies in the shadow of an impressive sheer cliff face which is just the visible portion of an even more impressive headland. There are organized walking treks to the top of the headland and it's breathtaking views all the way. Catch a tricycle taxi to Las Cabanas (₱150) and plonk yourself down out front of Orange Pearl Bar for a day away from the crowds on a white sandy beach and crystal waters. It's a short walk down a dirt road from where you will be dropped off. There is also an island with some OK snorkeling which can be reached easily wading through waist deep water. There are numerous destinations to visit... even Nacpan beach is possible for the adventurous. Bikes range from ₱400-500 per day. "Discover El Nido", next to Together Pension, on Calle Amboy street offer good rates and provide a map/guide detailing 12 routes. Taking the budget, healthy way to see El Nido rewards travelers with routes through traditional villages along forest trails, roads and dirt tracks. For the adventurous, rivers, rice fields, coconut groves, hot springs, mangroves, waterfalls, caves and off-the-beaten-track beaches await. The Philippine Experience is a full day adventure that offers an insight into the Philippines & its people with boating, fishing, walking, trekking, a mini cooking course, making coconut oil, coconut tree climbing, trying local languages, crafts, skills & games. I can be booked at selected accommodations and booking offices around town. It runs Monday, Wednesday, Thursday & Saturday from 9AM to 4:30PM and costs ₱1500. Island Hopping - There are many island hopping tour companies throughout El Nido. They all offer similar tours and prices; therefore it is not necessary to shop around for the best tour company or price. You may want to check a few different companies to see how empty or full their boats are. All tours leave between 8 and 9AM. Generally speaking the number of and standard of eating houses are very good. Menus have good variety mostly European, American and Filipino dishes, and prices are moderate. Most are accessible from the laneway as well as from the beach and seating has the advantage of views of the bay and environs. Aplaya Restaurant - Great food, portions are big for the price range and relatively nice atmosphere. Not too crowded. Dishes include Seafood, Chopsuey, Pancit Noodles, Beef dishes, Pizzas and pastas. There is free wifi, just ask the staff for the password. El Nido Corner - North end of the beach in El Nido. Great beachfront restaurant with a Danish owner. Try the fresh catch of the day. Marber - Great food and atmosphere right on the beach. Dishes include pasta, pizza, sandwiches, Filipino and German food as well. Nice staff and reasonably priced. Balay Tubay Bistru at Galeri - Live acoustic music is played while you dine in Balay Tubay Bistru at Galeri, they offer pizzas, European and Filipino dishes. El Nido Fastfood - offer nido soup; bird's nest soup perhaps. The Alternative - offers tasty & health-conscious food at good prices. Also has a pair of scenic beach-perched "nests" available for dining. Altrove Trattoria - Great freshly made brick oven pizza. Filipino Listless Eateries - a couple of them on the main street, for prices around 70P. As most of the accommodation in El Nido town is lined one-next-to-another along the road parallel to the beach it is pretty easy to find a room that suits budget and needs. Booking recommended during Christmas, Easter and Chinese New Year, as all places especially on the beaches can become full. Tapik Beach Park Guest House - Sibaltan. room from ₱480. El Nido Sands Inn (Bay View Inn) - Dorms and privates available. Common area over the water. dorm ₱250 per person. 🏠 Serena St.
You can quite easily send yourself money online & pick it up at an authorized place in town. You could also cash up in Puerto or Manila before you set out. In case you have run out of cash you also have the following options: El Nido Boutique & Artcafe can give cash advances on credit cards but charges a hefty 8% surcharge. You can change major currencies for a fair rates. Accommodation, dive operators and some restaurants also accept credit card payments, this can save some of your cash as well. The climate in El Nido is distinguished by two seasons: generally dry, from December to May, and wet, from June to November. April and May are typically the driest months, while the heaviest rainfall occurs around August. The Northeast wind blows from December to March, occasionally interchanging with the North wind during December to February. The Southwest wind is felt from June to October while the East wind, the mildest of all winds, blows during the months of April and May. The average surface temperature ranges from a low of 22 °C to a high of 33 °C. The coolest temperatures are usually experienced during the month of January, while the hottest temperatures are felt in April and May. The current in El Nido differ from very slight to moderate depending on tidal conditions. Divers and snorkelers can swim back to the boat without difficulty since currents are usually very manageable. The average water temperature ranges from 24 °C to 26 °C during the months of December to March and 26 °C to 29 °C during the months of April to November. Water visibility ranges from 3 meters to 10 meters from December to February, 10 meters to 30 meters from March to May, and 10 meters to 15 meters from June to November. The best time for diving at El Nido is during the months of March to May, as surface conditions are good. Smart - El Nido town is currently served by a permanent Smart Communications tower in the neighboring mountains. Globe - A temporary Globe Communications tower sits on a private lot along Rizal St. with plans to construct a permanent tower in the works. Internet Access - There are many Internet cafes in the town. Most restaurants, bars and guesthouses have free wifi. Condé Nast Traveler has ranked El Nido as #1 in its list of "20 Most Beautiful Beaches in the World." All 10 episodes of the 7th edition of Les Aventuriers de Koh-Lanta, the French franchise of the popular reality American TV show Survivor was entirely shot in El Nido in 2007 and was aired to 7 million viewers in Europe. The "Desert-Island Special Challenge" or the episodes 59 and 60 of the 3rd season of the most-outstanding comedy program in South Korea, Muhan Dojeon (aka Infinite Challenge), was entirely shot in El Nido in 2007. Some of the scenes of the 4th installment of the Hollywood movie entitled Bourne Legacy are filmed in El Nido. The 3rd and 10th seasons of Expedition Robinson, a Swedish version of Survivor, was shot in Cadlao Island in El Nido in 1999 and 2009. The second season of the Dutch television dating show Adam zkt. Eva was filmed on various islands in the Bacuit archipelago. Leg 12 of The Amazing Race 5 was shot in the Bacuit Bay of El Nido in 2004. Actress and FHM Philippines' Sexiest Woman for 2006 and 2007, Katrina Halili, was raised in El Nido and represented the municipality in the Miss Palawan beauty contest, wherein she was short-listed as one of the finalists. She is a descendant of the first Chinese families who migrated to El Nido at the end of the 19th century. The archipelago in the game Chrono Cross is called El Nido.